Scene from the Pantomime of Harlequin and the Dragon of Wantley at Sadler's Wells Theatre. 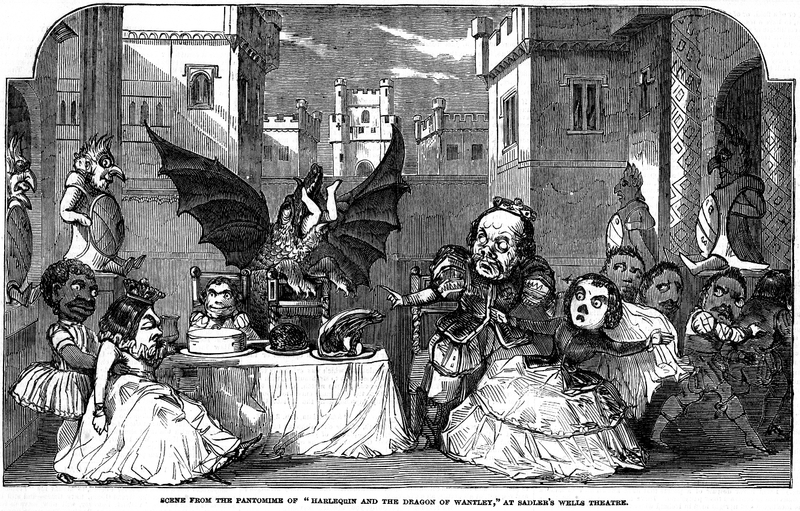 The scene selected by the artist from the pantomime of "Harlequin and the Dragon of Wantley," at this theatre is that in which the voracious Dragon gobbles up a child just as the Baron of Wantley is sitting down to his family dinner. After satisfying the immediate cravings of his inordinate appetite with the best of the Baron's viands, he finishes with carrying off the Baron's daughter, whom, as a delicate morsel, he reserves for a future repast. In this intention; however, the Dragon is disappointed; for Moore of Moore-hall, being in love with the young lady, pursues the spoiler, and, in a pugilistic encounter, gives him a blow that proves a complete "settler." Then, of course, as nothing else remains to be done, everybody is transformed, and the usual pantomimic tricks and bustle ensue. This is a scene of genuine pantomime: the grotesqueness of the masks is as legitimate as any five-act play.